LONG POND, Pa. – Going out late in a light rain in the final round of NASCAR Sprint Cup Series knockout qualifying at Pocono Raceway, Brad Keselowski edged Team Penske teammate Joey Logano for the top starting spot in Sunday’s Axalta “We Paint Winners” 400 (1 p.m. ET on FS1). For the second straight week, Logano paced each of the first two rounds but came up just short on his money lap. Keselowski toured the 2.5-mile triangular speedway in 49.525 seconds (181.726 mph) to edge Logano (181.400 mph) by .089 seconds. 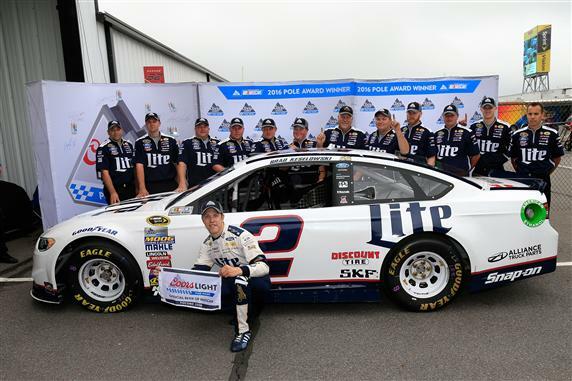 Keselowski won his first Coors Light Pole Award of the season, his first at Pocono and the 12th of his career. For Keselowski, speed in qualifying typically translates to a strong performance in race trim. The driver of the No. 2 Ford has finished in the top 10 each of the last nine times he has won a Sprint Cup pole. Seven of those finishes were fourth or better, with two victories. “I don’t think of us as a team that is a qualifying-focused team,” Keselowski said. “In general, we work on things that pay off in the race and not qualifying. So when we have speed in qualifying, that’s usually a sign of how strong we are in race trim. Logano knew where he lost the pole position to his teammate—in Turn 1. “I was trying to get a little bit more in that last round, which we all did,” Logano said. “I just hit the track a little bit with the splitter, and it bounced me up the race track about a lane, and I ended up running a lane up all the way through that corner. Matt Kenseth (181.316 mph) qualified third, followed by Kevin Harvick (181.192 mph) and Carl Edwards (180.759 mph). Tony Stewart will start sixth and Jimmie Johnson seventh. Dale Earnhardt Jr., who advanced to the final round of a non-restrictor-plate knockout qualifying session for the first time this season, claimed the eighth spot on the grid for Sunday’s race. Note: It was a banner day for Team Penske. Not only did the Sprint Cup cars sweep the front row at Pocono, but Penske cars will start 1-2-3 in the first race of an IndyCar doubleheader on Saturday at Belle Isle in Detroit.